Plus is part of the Millennium Mathematics Project at the University of Cambridge. 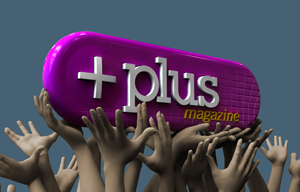 Plus reached more than 1.6 million readers over the past year, in countries across the world; however, the project receives no statutory funding and is entirely supported by donations and grants. Our activities are only made possible by the generosity of organisations and individuals committed to the future of mathematics education and to improving the public understanding of mathematics. If you value Plus, we would be very grateful if you would consider making a donation. Your contribution, no matter how big or small, will enable us to keep Plus as it is: interesting, intelligent, fun, and - very importantly - freely accessible to all our readers. Online: You can donate by credit card online via the University of Cambridge Development Office's secure site. Giving in this way means that, if you wish, your donation can benefit from Gift Aid, making your gift worth even more to us at no extra cost to you. Alternatively, if you prefer, there is further information on other means of giving, including how to make a donation by telephone or post, on the University Development Office website. 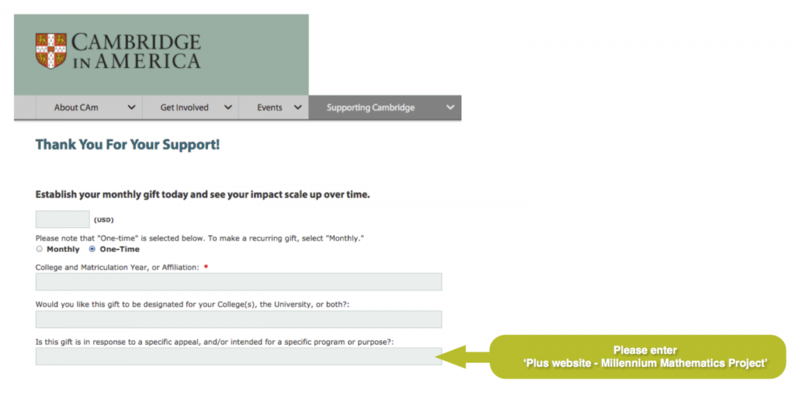 If you are a US taxpayer you may prefer to donate via Cambridge in America. Cambridge in America is a 501(c)(3) tax-exempt organisation (recognised by the US Internal Revenue Service) which funds grants that benefit Cambridge University and its member colleges and departments. Gifts to Cambridge in America qualify for an income tax deduction to the limits allowed by law. You can give online via the Cambridge in America secure online gift form. In the box on the form asking whether you wish to donate to a specific program, please state that you would like your gift to support 'Plus website - Millennium Mathematics Project' as illustrated below (please note that it is important to cite the Millennium Mathematics Project as well as Plus to ensure the correct destination for your gift). Alternatively, there is further information about ways of giving on the Cambridge in America website.